Although I was raised in a small Maryland town not far from the countryside and dairy farms galore, it wasn't until I began traveling to Ireland that I really began to have an appreciation for all things dairy. I'll always remember one of my Irish cousins describing coming home from college to the sublime treat of a poached fresh egg lovingly cooked for her by her mother, a skilled home cook and baker. Farm fresh eggs, golden butter, silky smooth and rich milk and cream - these are just the starter elements of Irish dairy. Don't get me started on the cheese! 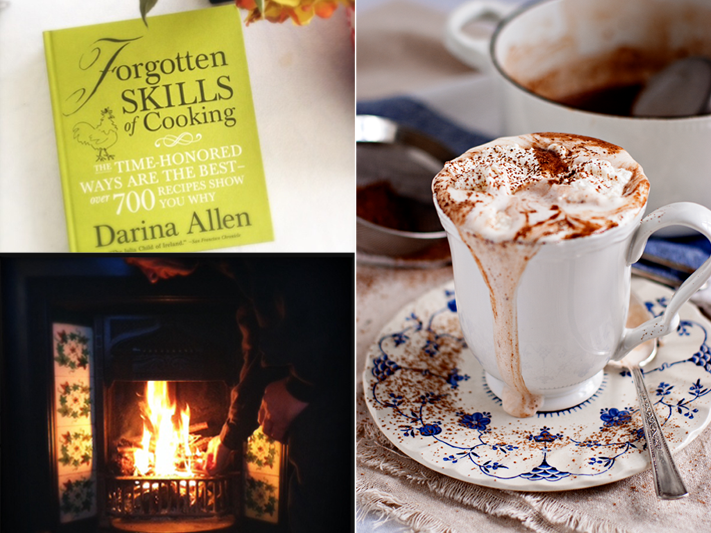 A recent gift of Darina Allen's Forgotten Skills of Cooking further solidified my appreciation. So revered is milk in Darina's book that an entire chapter is devoted to it--the prologue to which is not to be missed. 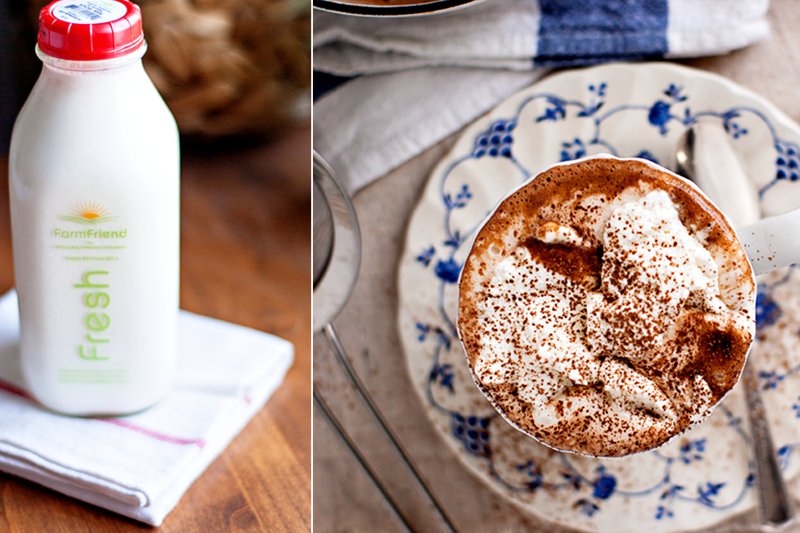 Recently, when I began to slightly fixate on homemade, comforting hot chocolate, I knew there was little point in making it myself unless I began with high quality milk and cream. Enter Trickling Springs Creamery. Trickling Springs' Farm Friend milk is traceable to FarmFriend farmers whose farms undergo stringent inspections, and is harvested from humanely treated, grass-fed cows who are not given any synthetic hormones. It's all locally produced and processed with low-temperature pasteurization. In other words, this is good milk. 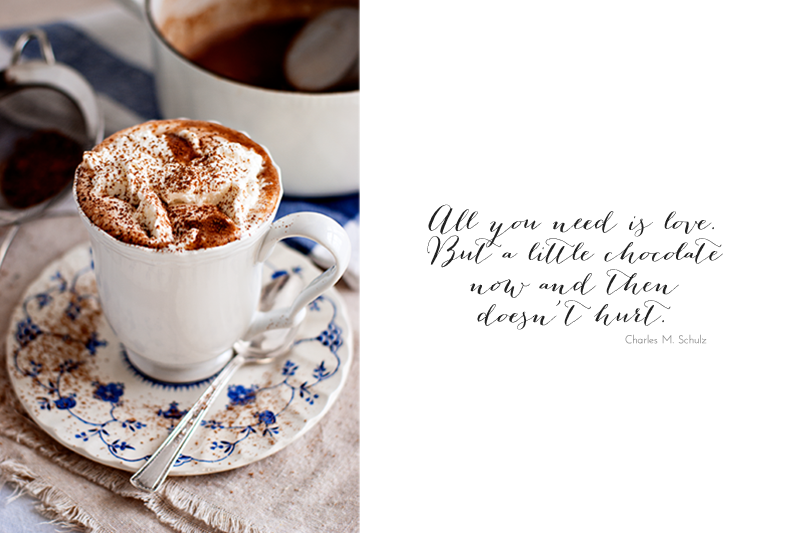 There isn't much better in life than comforting hot chocolate, a warm fire, and good company, is there? In a medium saucepan, heat the milk, half-and-half, and cream over medium heat until just below the simmering point. Remove the pan from the heat and add both chocolates and stir until melted. Once the chocolates are melted, add the sugar, vanilla extract, and espresso, and whisk vigorously. Reheat the mixture over low heat and serve immediately. I spiked mine with a splash of bourbon laced vanilla extract...how will you make yours? © 2006 - 2013 Elizabeth McNally. All photographs are copyright Elizabeth McNally unless otherwise credited. Please do not use my photographs without written permission from me. Free wallpapers may be used for purposes of desktop wallpaper only and may not be sold.